Concerned parents come to us with questions all the time about the potential health concerns of pacifiers and thumb sucking. We can appreciate their concerns. Sucking is a natural reflex developed even before babies are born. Though an inherited reflex, sucking becomes a habit during infancy. Infants and toddlers find comfort in sucking on pacifiers or fingers and use these tools for self-soothing. There are a few important things you need to know about pacifiers and thumb sucking and how it can affect your child’s oral and dental health. As mentioned above, sucking on a pacifier or a thumb can be quite soothing for an infant. It is important that babies and toddlers feel safe and secure. There is also evidence that pacifier use at bedtime can reduce the occurrence of Sudden Infant Death Syndrome (SIDS). 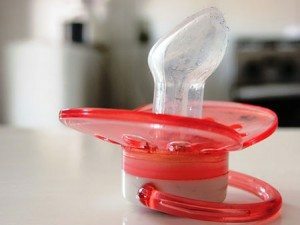 Infants who use pacifiers while sleeping do not sleep as deeply as those who do not use pacifiers; therefore, there is less of a risk for the infant to stop breathing. Constant sucking on a thumb or pacifier takes a toll on oral health. Long-term sucking can cause the top front teeth to slant out and bottom front teeth to tilt in. Crooked teeth are not just an eyesore; they can be quite painful. When teeth are growing in and pointing in different directions, they begin to crowd. Crowding can cause gum soreness and painful toothaches. Sucking on thumbs and pacifiers can also cause the jaw to become misaligned. A misaligned jaw can cause another list of issues and pain. Though crooked teeth can be sorted out when baby teeth are lost, a misaligned jaw is not as easy to repair. Consistent sucking can also cause narrowing of the roof of the mouth. When the mouth becomes misshapen, it can become difficult to chew, and it can even affect speech. Pacifiers and hands are constantly in contact with dirty surfaces and germs. Sucking on a contaminated pacifier will flood the mouth with bacteria which can lead to tooth decay and can also cause oral infections. Infants and toddlers who form this habit commonly suffer from frequent ear infections. This is a result of secretions from the throat seeping into the middle ear. Make the pacifier unappealing by dipping it in lemon juice or another harmless unpleasant-tasting substance. Cut the tip off of the pacifier to reduce the sensation. A good place to start could be to allow pacifier use at bedtime only, this practice will make the weaning process much easier while still allowing your child to soothe and rest easy when it counts the most.